When it comes to SaaS metrics, there's no shortage of people telling you new ways to track and measure your business. With such a wide pool of methods and calculations, inaccuracies are bound to happen. Ezra Fishman of Wistia took part in a SaaSFest panel last December to share how he and the Wistia team approach modeling CAC (customer acquisition cost) and LTV (customer lifetime value) and explained that when you first start modeling and trying to predict different metrics, you want to start as simple as possible. Only as you gain further understanding of the metric within your business model, should you add complexity to the calculation. Before we elaborate more on his approach, let's review two fundamental SaaS calculations: customer acquisition cost and lifetime value. We’ve written extensively here on the Profitwell blog (and Price Intelligently blog) about CAC/LTV and how to calculate and optimize these metrics. Let's start with the importance of these two metrics and what they actually mean to your business. It’s important to understand your CAC metric because it is very easy to throw a lot of money at acquisition initially without getting the proper returns. It should be a top priority to know and optimize your CAC so that your payback period isn't more than your business can handle from a cash flow perspective. If you’re consistently spending more to obtain a new customer than the lifetime value of the average customer then that’s an indicator that you need to adjust your acquisition approach to secure future revenue. LTV is the total dollar amount you’re likely to receive from an individual customer over the life of their account with your company. Lifetime Value helps you to predict your business’s revenue and profit numbers. You want to track this metric carefully because your customers' LTV needs to exceed the total cost to acquire them. If your LTV is lower than CAC, you are definitely losing money with each new customer you add. Remember, you need to be reducing CAC, optimizing your acquisition channels, and increasing LTV so that your business can make money and be profitable. Now that we have an understanding of what CAC and LTV are, we can dig deeper into Ezra’s framework for modeling. Modeling your metrics without a deep understanding of them is like reading Shakespeare to a toddler. Start simple. Add complexity overtime. 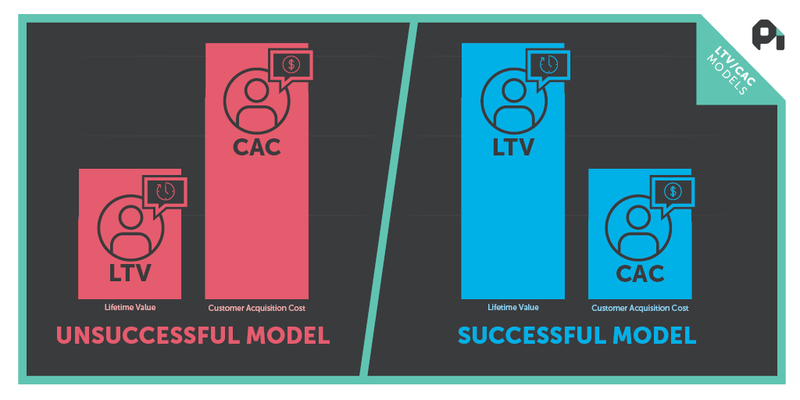 As Ezra suggests in his SaaSFest talk, you should be modeling CAC and LTV in your business. Modeling your metrics gives you a clearer understanding of your current and future performance as well as an ability to plug and play with different variables as needed. Most people in SaaS are calculating their metrics imprecisely with over-generalized CAC and LTV calculation methods. You want to tailor your metrics to the evolution of your business to account for any change whether it's growth and contraction. By modeling regularly your projected performance for CAC and LTV, you give yourself chance to ask questions, dig deeper and understand your business model better. To begin modeling, you want to start very basic. With using a modeling method it’s important to start off at a basic level. The initial formula will be quite simple. You can start by asking yourself these questions? How much did we spend in sales + marketing this month? 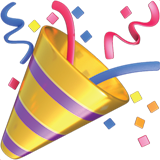 How many new customers did we gain this month? What’s ARPU (average revenue per user) across all our customers? What’s our churn rate (customer x) this month? What’s our rough gross margin? Don't worry if you have trouble initially figuring out these numbers. Many companies don't track this stuff internally regularly or in an organized fashion. If that's the case, now's a great time to get your house in order. As you grow, you will want to rely on historical, current, and future performance of CAC and LTV. You will continue to refine this process each time and eventually land on a more complete and complex model that is representative of how your company is doing. Model 8 is simply an exaggeration of how many models it will take between the first one and the one you finally settle on for your insight. (It may take even more than 8) The point is that you continue to expand the variables to explore different channels or avenues affecting the results. Between each iteration, ask yourself: “What am I not learning in this model? What needs to be built to answer the next set of questions and answers?" You evolve the model into a more complex (and therefore, fewer lies) version. You will start to get into the customization of variables based on your business and you will begin making these metrics come to life. Build complexity as you iterate. Ezra shared the above graph during his talk. 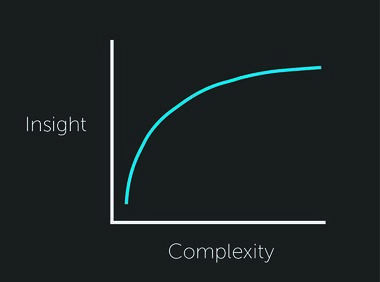 It illustrates the relationship between insight and complexity for modeling. Insight is needed initially. Once a deep understanding exists, complexity can increase and provide even further valuable insight. The layers and variables you choose to add to your model should be a direct reflection of the business' needs. For example, you may have some specific areas you want to test so you would add them to the variables within the equation of the metric to monitor the channel activity. 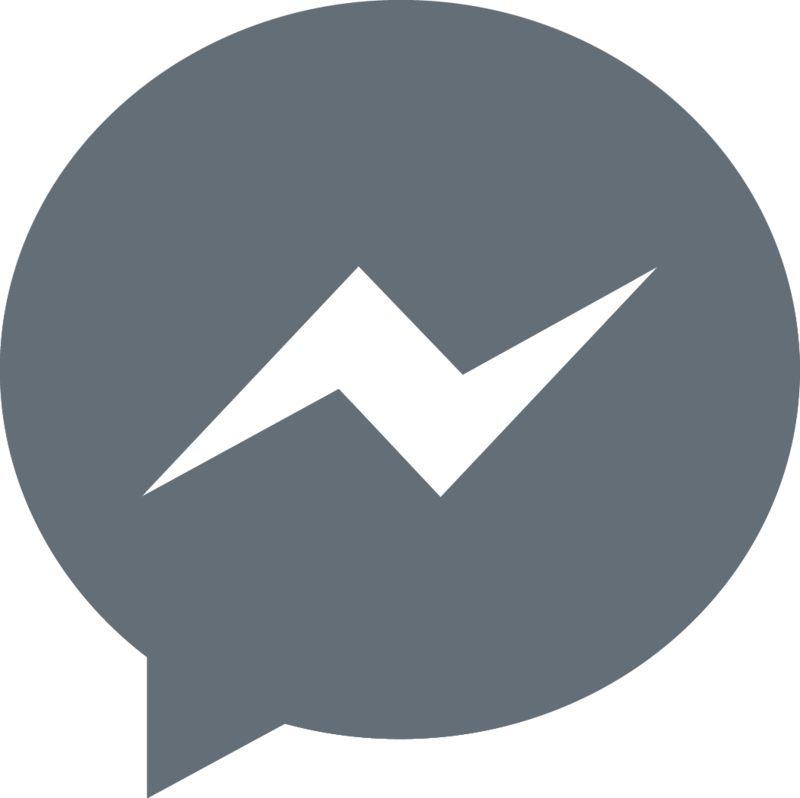 Perhaps, there are different customer segments you’re curious about that you want to begin tracking. The good news is that a modeling system gives you the ability to explore and understand more deeply what is happening. It's important to note that you should only be adding layers to the model if you have insight to gain into a specific area. Each layer dimension will add complexity to your model which overtime will diminish the lies (or rather, lack of clarity) from the initial model. In the process of adding these dimensions you will learn what's needed to optimize your business so that you can get the highest returns from your customer acquisition efforts. The key takeaway here is to build complexity in your CAC and LTV metrics gradually to become more accurate. At the beginning stages of a business, a lot of the raw ammunition that moves the organization forward is based on unclear assumptions. Accuracy is key and it only comes from understanding data and experimentation. Having a system for modeling your metrics gives you the ability to adapt to the business' current needs. Evolving the model over time will yield better decision making for your business giving you the insight needed to manage your acquisition costs and increase your customers' lifetime value by implementing decisions rooted in data.